You know things are bad when it's not even possible to drum up enthusiasm for the seed catalogues. There are just three new to me plants that I have an inclination to try this year. 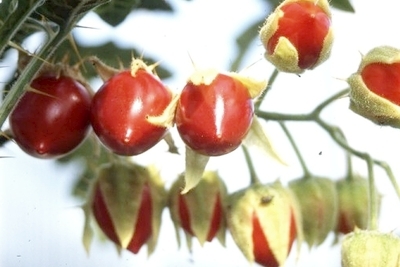 The first is vila vila also known as Solanum sisymbriifolium, the Litchi tomato or Morelle de Balbis in France. I've long wanted to give this prickly relative of the tomato a go, spotting both its blight resistance and antagonistic foliage as vital components in my fight to produce a range of vegetables outside in the menace of Phytophthora infestans and deer. For a while Alan Romans was offering it as pest reducer for potatoes on his now sadly defunct seed potato site but I was always going to try it another year and left it too late. Promises of swaps from other gardens were never taken up so I'd let it slip away again until some mad enthusiasts started a facebook group - here - and was lucky enough to receive some seeds from a group member. So I'm all set for this year's experiment. 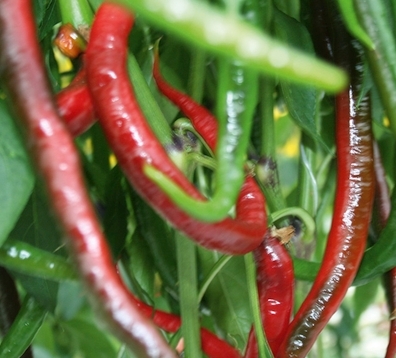 Joe's long cayenne pepper is a chilli pepper I spotted when we went to the Eden project in the autumn. Chillies aren't my obsession but I'm looking for a range of fruit with medium heat for my rather moderate chilli heat requirements and so am mostly pinning my hopes on the tree chilli but these were stunningly attractive and if they taste nice are worth a space for the added appeal of the plants. The picture (and the plants at Eden) are Suttons and the link will take you to them where they offer seeds and plants this year but they once offended me so I won't buy from them any more. The seeds are also available in other places, I'll probably be getting mine from the supplier in the name link. 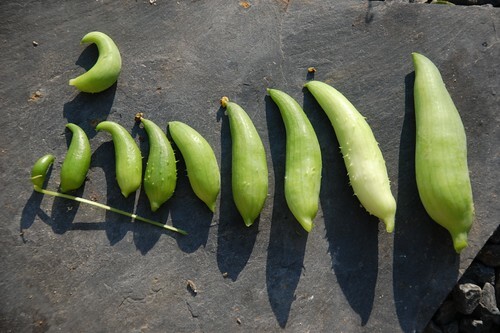 Another plant that doesn't exactly meet my criteria for truly delightful is the achocha. It's an attractive climber, good for covering a trellis and absolutely adored by insects, tree wasps and other little creatures but the fruit, used as a vegetable, is utterly tasteless and only useful as a filler in curries and stews or paradoxically stuffed. Even then it's best used as small as possible and life's too short to stuff a tiny achocha. But it seems the Bolivians have thought of that and developed a variety where the fruit grow huge. That picture above is of the ordinary sort I had from the HDRA years ago but imagine the largest one as as long as a man's hand. That's quite a giant lady's slipper achocha and although it may need a bit more protection than its smaller siblings I thought I'd give it a chance. Still, I'd like them to be good to eat and perhaps, like apples, different varieties have different merits. I hope so.